Patric Young was a legitimate NBA prospect before he stepped foot on Florida's campus, a McDonald's All-American who was expected to make an immediate contribution for the Gators. Yet, he struggled initially, posting a remarkably unproductive freshman season that left scouts and fans alike scratching their heads. During his sophomore year, Young improved, but he still struggled with bouts of inconsistency. The question entering his junior year remains: will Patric Young's basketball ability ever catch up with his elite physical and athletic profile? At first glance, it is easy to see why Young has been an NBA prospect since he was a teenager. Standing 6'9 with an excellent 249-pound frame and a long 7'1 wingspan, Young has looked the part of an NBA big man for quite some time. He also possesses an elite athletic profile, equipped with freakish explosiveness around the basket and excellent lateral quickness, and showing outstanding speed in transition. While technically undersized for an NBA center, Young's elite physical and athletic profiles suggest that he can probably defend either post-position at the next level. Young is not a prolific scorer, posting just 15.6 points per 40 minutes pace adjusted last season. That is not to say that he was not, at times productive as evidenced in his 25 point performance against Arizona, 19 against Alabama, and 21 against top-ranked Kentucky. Furthermore, he increased his 2-point percentages from 55.6% as a freshman to an impressive 61.8% as a sophomore. He posted almost as many single digit-scoring nights as he did double digits, however, showing that while he showed flashes of dominance, he largely struggled to produce consistently. This discrepancy is particularly vivid on film, where Synergy reveals that he finds the majority of his possessions in the post. Young does an excellent job of carving out space in the post, controlling entry passes, and finishing around the rim. The problem is that his footwork is not particularly advanced and he has only a few reliable post moves, primarily his jump hook, which he can launch with his right and left hands, and various combinations of spin moves and up-and-unders. His post-game ultimately remains basic and before he can approach his ceiling as a dominant post scorer, he must further develop his footwork and expand his post arsenal. Despite his proficiency in the post, however, Young struggles with bouts of passivity, represented in the 12 games in which he attempted five or fewer shots. Another alarming trend is his extremely low 3.7 free throw attempts per 40 minutes pace adjusted; this is an improvement from 2.3 attempts per 40 minutes pace adjusted from his freshman year, but nevertheless rates him just outside of the bottom 10% of prospects in our top-100 rankings. Where Young is dominant, however, is when he doesn't have to create his own shot. He runs the floor hard and throws down acrobatic dunks in transition while also showing the ability to finish off cuts to the basket. He is also a good offensive rebounder and he finds quite a few shots by outhustling his man in traffic and tipping in his teammates' misses. He also shows some potential as a finisher in the pick-and-roll, where he rolls to the basket extremely quickly and often finishes with an emphatic dunk. This aspect of his game, in particular, is where Amar'e Stoudemire comparisons seem most apt and scouts will be watching to see if he can further develop in this area. Playing alongside Florida's shot-happy guards likely had plenty to do with his lack of offensive consistency, as it's difficult to say that his strengths were being showcased in the past two seasons with Erving Walker and Kenny Boynton playing such dominant roles. Young took just the sixth highest percentage of shots on the team last year, despite being by far their most efficient player. Now that Bradley Beal and Erving Walker have moved on, it is time for Young to show scouts that he can be more productive on a nightly basis while showing some development in terms of creating his own offense. Defensively, Young's physical tools alone  his top-tier explosiveness, strength, lateral quickness, and length, in particular  allow him to be a competitive defender at this level, even if he is undersized for the NBA center position. Luckily, he also shows solid focus and energy on defense, guarding a variety of variety of NBA caliber post players and doing a fairly good job of holding his position and denying his man the ball. He is not outstanding guarding perimeter oriented big men, where he oftentimes fails to maintain his stance when taken off the dribble and struggles to close out on shooters. He also could stand to improve guarding the pick-and-roll, as he sometimes loses track of his man and allows open jump shots. Finally, it's worth noting that while Young is hardly the type of rebounder one would expect given his size, strength, and athletic advantages at this level. Just as he did during his freshman season, he averaged just 5.7 defensive rebounds per 40 minutes pace adjusted as a sophomore, which ranks amongst the worst for center prospects in our top-100. His small hands are certainly a factor and, therefore, he really must work on his fundamentals and maintaining his focus to compensate. While Young is likely to be drafted in the first round based on his physical attributes alone, there are quite a few questions that remain about what kind of player he can be at this level, let alone in the NBA. As he looks towards his junior year, Young must focus on refining his post game and improving his fundamentals and awareness across the board. Players with his tools are extremely rare, and it is really up to him to determine just how good he can be. Florida will look very different next season and Young should have more opportunities to assert himself as a viable offensive option. If he does, and Florida continues its winning ways, then expect him to shoot up draft boards come June. Patric Young's production fluctuated greatly from game to game for Team USA at this Under-19 World Championship. He took turns alternating between flashes of brilliance and disappearance. Young's impressive physical tools have never been in doubt. That was again true in Latvia. With a frame and vertical explosiveness similar to Amare Stoudemire, Young was responsible for some of the best highlights at the event. Fireworks aside, Young was limited somewhat by his below average skill level and the lack of playmakers on his team. He was mostly relegated to finishing whatever balls he could get his hands on around the basket, converting an outstanding 72% of his 2-point attempts (second best at this event), mostly in the form of thunderous dunks. Young also made a significant impact on the defensive end, playing with a tremendous energy level when fully dialed in. He took charges, controlled the glass and changed absolutely everything around the basket. To make the next step in his development, Young will need to show some improvement with his post game and all around offensive polish. Coming off a mildly disappointing freshman year (or at least up until the last six weeks or so of the season), he will be asked to step up his production considerably with the graduation of frontcourt starters Vernon Macklin, Alex Tyus and Chandler Parsons. Judging by his performance here in Latvia, that's something he's more than capable of doing. 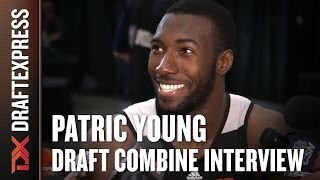 The main post presence of this USA basketball squad, Patric Young confirmed much of what we wrote about him a few months ago at the McDonald's All-American game and even showed a few more wrinkles to his game. He's still the same exceptionally gifted big man from a physical standpoint. He has a chiseled frame and excellent athleticism, making him a significant presence on the offensive glass and on the defensive end. He showed more flashes offensively than we thought he would, though, executing some interesting post moves, knocking down a mid-range jumper, passing intelligently out of double teams and finishing extremely well through contact. It will be interesting to see how this translates next season when he plays for Florida. He's looking more and more like a top prospect at this point, especially when taking into consideration his rock-solid intangibles. From a physical standpoint, there may not have been a more impressive player in attendance at the McDonald's game than Florida commit Patric Young. He has good size at around 6-9, sports an incredibly chiseled frame and is a very good athlete on top of that, looking mobile and explosive, making him a fairly rare commodity. Young doesn't seem to have any misconceptions about the type of player he is, which is a very good sign considering his profile. He's a force on the interior thanks to his terrific physical attributes, showing great toughness and a high intensity level, and having no problem throwing his weight around in the paint to get the job done. He rarely strays out onto the perimeter and doesn't seem too eager to show off his skill-level, showing a solid feel for the game and being very team oriented. Young will be able to contribute from day one in the SEC as a Kendrick Perkins-type rebounder, defender, screen-setter and finisher around the basket, as he's very effective in all those areas already and seems to have no problem playing that role. He'll need to continue to round out his skill-set as his career progresses, though, which means improving his polish as a back to the basket scorer, developing his countermoves, improving his ability to step away from the basket on both ends of the floor, and improving his passing ability and all-around basketball IQ. That's something you could say about pretty much any big man his age, and Young seems to have the work ethic and intangibles needed to do it.